Note: Look for deep red coloring in the juice, and the older the better! This can’t be made with fresh kimchi. If the kimchi you buy looks fresh (the cabbage leaves look white and not very flavorful), leave it outside on your kitchen counter overnight. 1. Heat up the sesame oil and add in the kimchi (save the juice and set aside). Sauté together, add in the spam, and continue combining it all together. 2. Add in the rice, and break it up mixing it with the kimchi. 3. Add the kimchi juice and the white parts of the green onions. The kimchi juice should turn the rice red. 4. Crumble or cut the seaweed and sprinkle it over and continue to combine it all together. 5. Taste and then season with more kimchi juice if needed. 6. Fry an over easy egg and add that on top. Garnish with the remaining green onions. Plate. Boom. Done. Enjoy! Helpful tips: Fried rice is best cooked with day old rice. If you don’t have day old rice, cook the rice, stick it in the freezer for about 30 minutes to an hour. If it’s too hot and fresh, the fried rice will turn out sticky. Also, this recipe doesn’t need any additional salt! 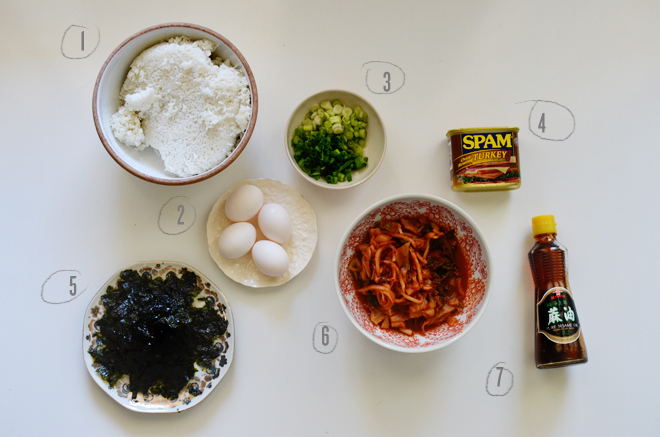 The kimchi has a very strong flavor, the seasoned seaweed has salt, and the spam is pretty salty too. 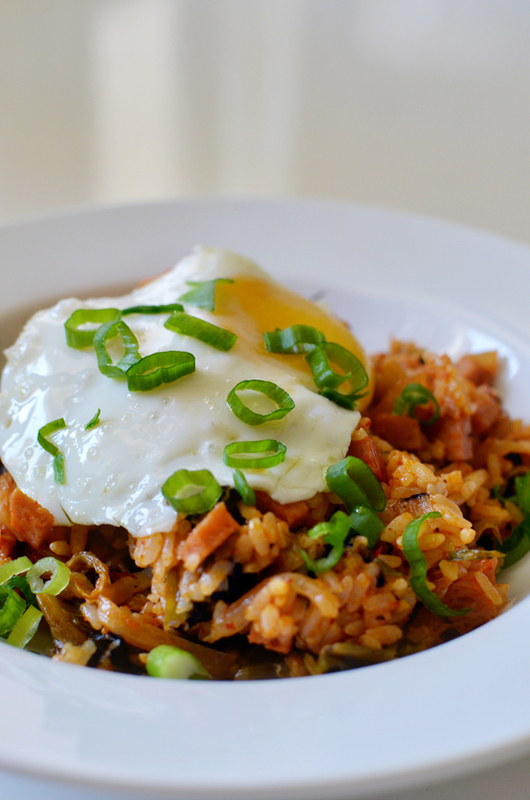 If the rice tastes bland, try pouring more kimchi juice to season it. Add butter with the sesame oil for extra flavor, but if you’re trying to keep it not as low nutrition as possible, leave the butter out! This recipe is shared and made by my BFF. I just took pictures as she cooked it for us the day I had my little surgery to get my cyst taken care of. She’s such a pal! It was totally a minor procedure, but she came for moral support and to make us lunch. I’m thankful for her (and all the yummy food she’s ever introduced me to). Seafood is my favorite type of food to eat, and Korean and Japanese are neck in neck right after. Korean food is just bomb diggity bomb. No joke. If you’ve never tried it, start with their Korean BBQ, and then work your way up to the bolder flavors. The first time I tried kimchi, it was too strong, but now I absolutely love it! There is much good flavor and spice. Spice! By now you all know how much we love spicy!!! Every time Linda has come over with dinner, it’s a new instant favorite and Ben and I are always trying to recreate it. Thanks for sharing the recipe Lin!!! OHHHHHHHH rubyellen, very good aspect!! nhami, nhami!! And, you have a wonderful BBF… good friends are one of our best things in entire world..
Hey there Ruby!!! This sounds fantastic… especially since I have a daughter who loves everything Korean (and wants to move there after college!). I have missed reading your blog… just looking back: the girls are cute as ever (and growing so much!). I’m sorry to hear you had to have some surgery and hope you are recuperating okay. You are such a great mom! I don’t know how you do it so well– you are amazing! Sending a big hug! I love your blog! But, really spam? You blog about the importance of finding a hose safe for drinking, but you eat spam? I am not trying to be rude or mean. I am poking at you like I would a friend. And I am not asking you to justify your actions either! Lol. Yes, spam goes in this. I knew it would raise eyebrows and I admit that it’s something I’ll eat once maybe twice a year (the turkey low sodium kind because it makes me feel slightly better). But it’s part of the recipe and some Koreans put it in the kimchi fried rice, so it’s there. No offense taken either to your comment! I also raised my eyebrows at the can of spam, it caught me off guard! For a second I thought it may be a vintage tin you stored something in… I don’t have a dietitian husband, so I am interested into his input. Does he eat it too? Haha the dietitian husband tried it because he’s open to trying new foods, but I think he had like a bite or two. While he said the flavor was good, he definitely wouldn’t eat it and actually, he doesn’t eat fried rice period. According to my best friend it’s not the same without spam, so she put it in so we can try it! I guess I didn’t realize I didn’t write what I thought of the dish, which I should have done. 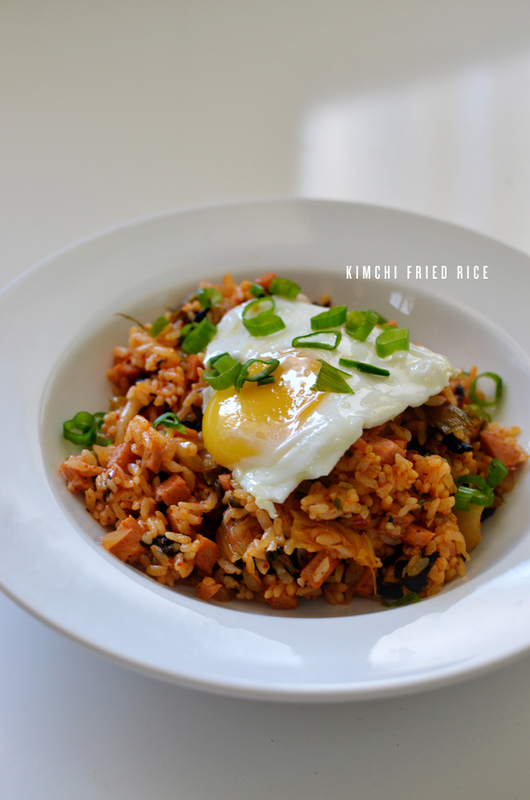 While I love Korean food, the kimchi fried rice isn’t my fave Korean dish, but I like trying different things so here is something different that I tried! I’m sure the fried rice would be good without the spam too! It’s was only half a can that was chopped and you really couldn’t even taste it, so it could easily be left out. 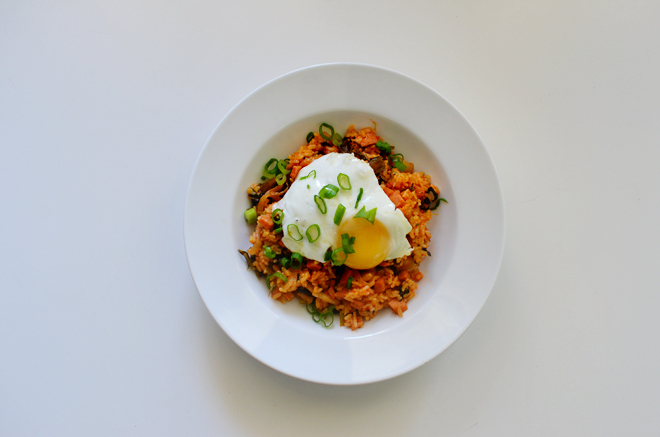 We just had kimchi fried rice over the weekend and it was delicious. And we make our own kimchi too. I have never heard of that before! Yes, would love to try it! Please email me the recipe!!! Thanks Cindy! Yum, yum, yum, this looks great! I love korean food and will definitely be trying this one out soon. Ever tried sam gyup sal? It is so delicious, but I have to admit I’m still figuring out how to actually make it right! I did it! I used your recipe to make the kimchi rice and posted my results here -> http://connecting4.com/ if you’d like to check it out.